With Mechberg on vacation, it is my honor to present to you the Week in Review. Ok, he wrote the first section but the rest is on me. So let’s get into this. "The April 2019 update features numerous improvements to the game, including the April Spotlight car, the 2018 McLaren Senna. At the top of the list is the latest iteration of Forza Race Regulations (FRR) which includes new UI improvements. With the latest version, incurred penalties will now affect a player’s final placement on the leaderboard. The team here at Turn 10 is still working hard on the FRR feature set and I know players are interested in when the public FRR beta will begin." "Elsewhere in the April 2019 update, we’ve got audio improvements to several cars based on community feedback and we’ve also unlocked a huge list of previously locked “exclusive” cars in the game. As of this update, the only cars that remain locked are the Forza 7 pre-order cars and cars specifically tied to career mode rewards." "It’s a huge streaming stardom week for DaCopilot who kicked off her own show this last Sunday. She was also this week’s guest on #WheelandPedalWeds with me. 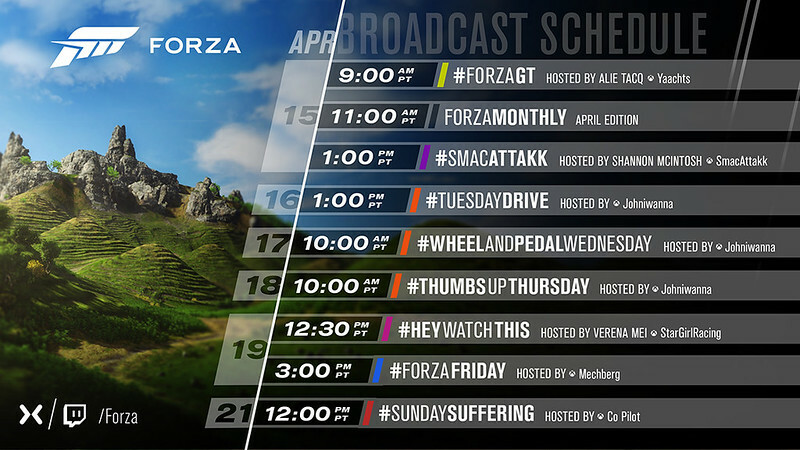 Lastly but not leastly, you will find her guest hosting for Mechberg today on #ForzaFriday. " 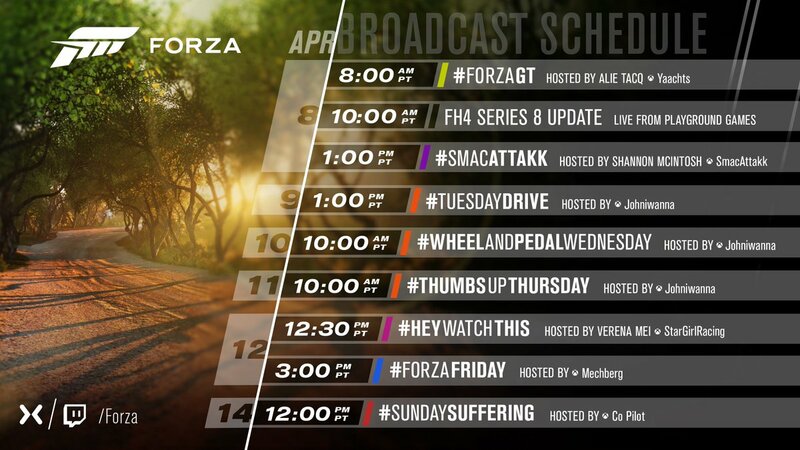 "And get ready for the next edition of #ForzaMonthly coming April 15 at 11 a.m. Pacific." "As we’ve said in the past, the Forza Race Regulations feature is in continued development at Turn 10, and players can expect more updates in May and beyond for the FRR feature set. Look for more details on all these updates in the future." "On today’s episode of #ForzaFriday we’ll be joined by Turn 10’s Andy Beaudoin, talking about his career in the games industry and the work he’s done here at Turn 10 as a design director. The show starts at 3 p.m. Pacific on the Forza Mixer and Twitch channels." 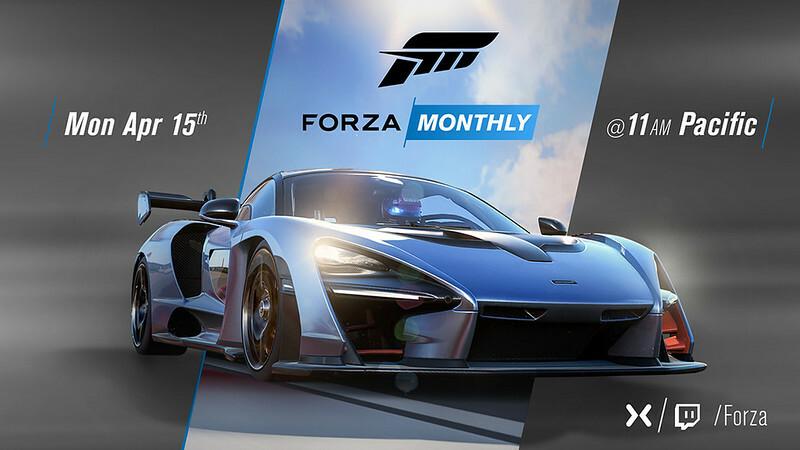 "The next edition of “Forza Monthly” arrives on Monday, April 15 and we’ve got a fun show planned for you. We’ll be recapping the latest updates for Forza Horizon 4 and Forza Motorsport 7 with guests from both Playground Games and Turn 10, and welcoming Formula Drift driver Vaughn Gittin Jr. to the show to talk about his latest projects, the Formula D season, and drifting in Forza from the perspective of a pro. The show kicks off on Monday starting at 11 a.m. Pacific, so don’t miss it!" Co Pilot races in hoppers with the community. Alie highlights the Le Mans Esports Qualifier Rivals event, and hopper racing. Shannon works on Free Play racing. Mechberg welcomes guest Andy Beaudoin to talk about his history as a developer before and at Turn 10.